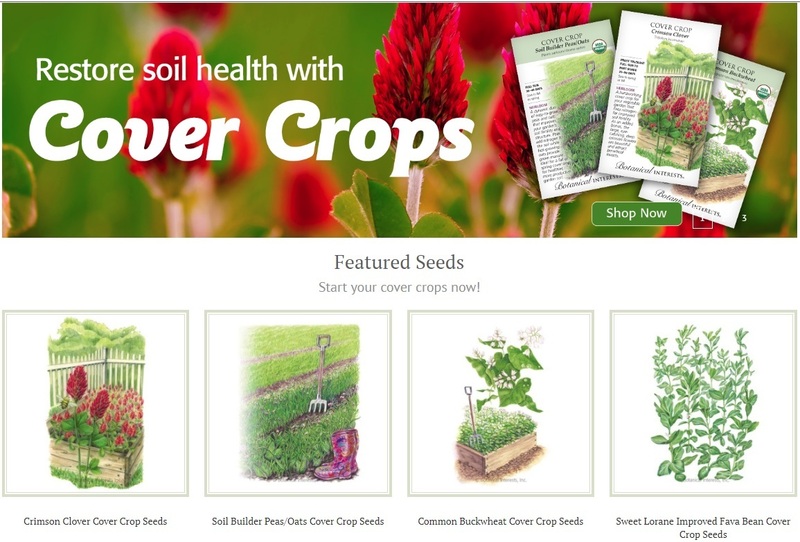 There is a lot of mention in organic gardening of cover crops to add back to the soil, either used in fallow cycles or between rows or under taller plants for weed control. 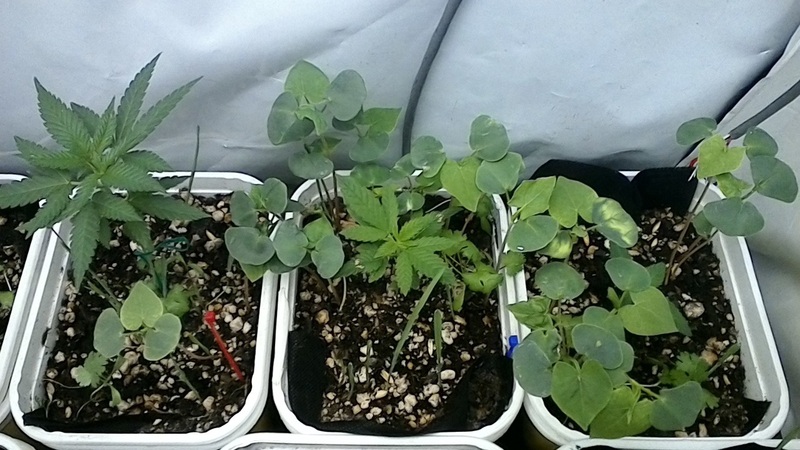 The few indoor no/low till show the planting and mulching etc, but not where or what to purchase for the small container grower. My grow log mentioned the buckwheat being used in my tubs this round. I've used their cat grass (oats) seeds before, the other brand had an invader seed, and like the way it roots quickly and makes the soil nice and spongy. 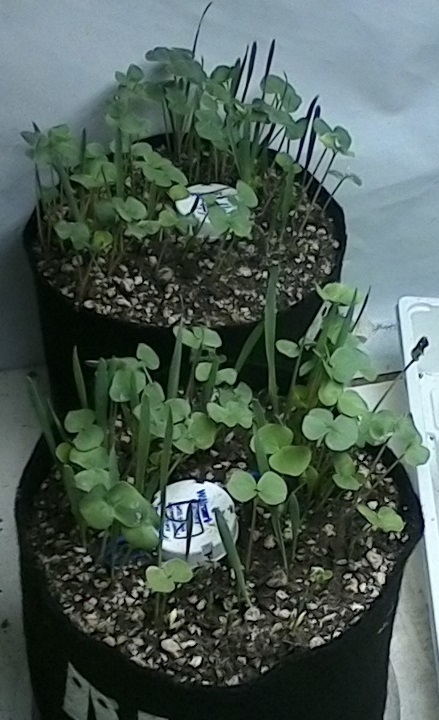 The buckwheat seems to have a long fleshy stalk, so far working on leaf set 2. I've cut a few down as they were too tall and floppy. Reading the peas/oats package it mentions the oats providing a support for the peas to climb. 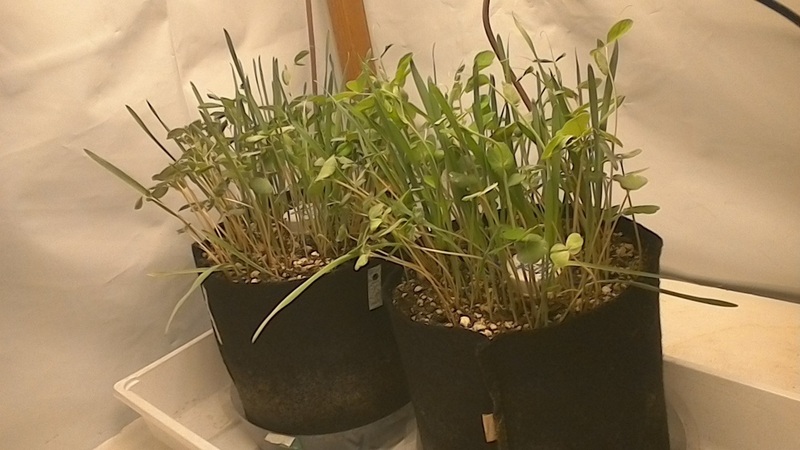 The cat grass with seedlings also help support until ready for transplant. 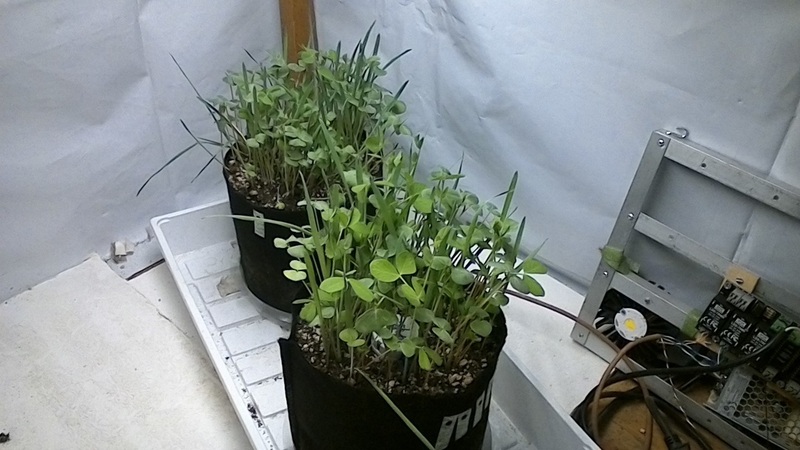 Will do a test patch with the combo or wait until setting up the bloom size containers in a few weeks. The package says maturity in 56 days, well before the girls will finish and probably will be in full shade by then anyway. 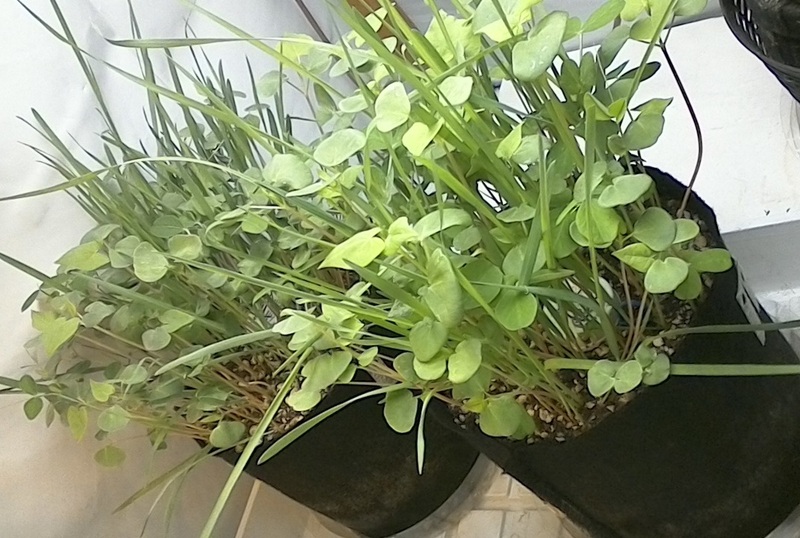 Chives are a vigorous plant and will winter over. I would avoid these as a cover crop. I have a massive clump that is spreading each year. This is the stuff I use in my planter boxes as well as smartpots not only are they great N fixers to the soil they will contribute to the organic matter matter also ! As of right know some are flowering which attract Benny's and reseading as well it's a 1-2-3 punch! Creating a multi-poly culture is what it's all about by attracting many more different types of microbes to the rhizosphere! 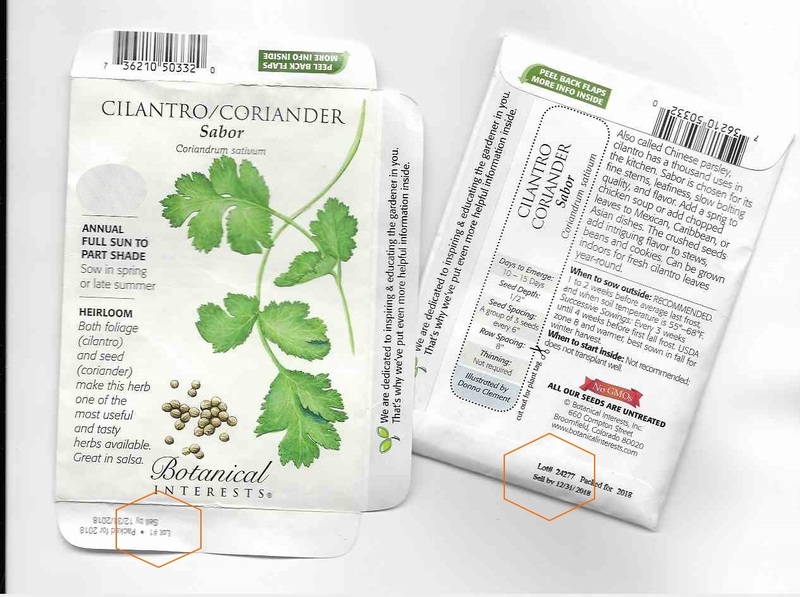 The package says Cover Crop - What did you expect it to do? The first scatterings of buckwheat is about even with the rest, the end one has a sunny opening in center. The oats are sparse above ground but they have a huge root system. Thanks for the build-A-soil link @Tinytuttle. Their price isn't bad for the mix they put together. Their half pound for $10 isn't bad. These run $2.99 for 65 gram (3 oz ?) says 7x10 foot area. Have a couple of planters dormant outside so might try these and letting them die off at first frost. Buckwheat on the left jar? I have some of that flowering right now and dropping seed! Looks like they'll be happy with the new neighbors! lol r your plants about 2-3 weeks old there? being able to shed the outer shell and need a bit of help. I use the build a soil mix, it's pretty nice except the viney stuff tends to be a pain in the ScrOG. I use sorrel as a living mulch in selected vege gardens and have recently put some in larger fruit tree tubs - looks pretty and is edible too. I have read that if you get some good living soil from a healthy place (which has not grown anything you want to grow for a couple of years to limit disease etc) mixed 1:4 with sand into black plastic bags then seeded with bahiagrass (or your favourite root myco colonising plant that is killed by frost) just after the last frost then it colonises the soil with myco friendly roots over summer then is killed at the first frost. Let the soil sit over winter then chop up the roots and use them and the soil as beneficial myco infestation for your normal potting and ground. Try to limit P in the mixture as it inhibits myco growth. I plan on starting an experimental area to try this just after the last frost after this winter, I will get results about 18 months after that. Apparently it is good for innoculants and myco production and it's really cheap. 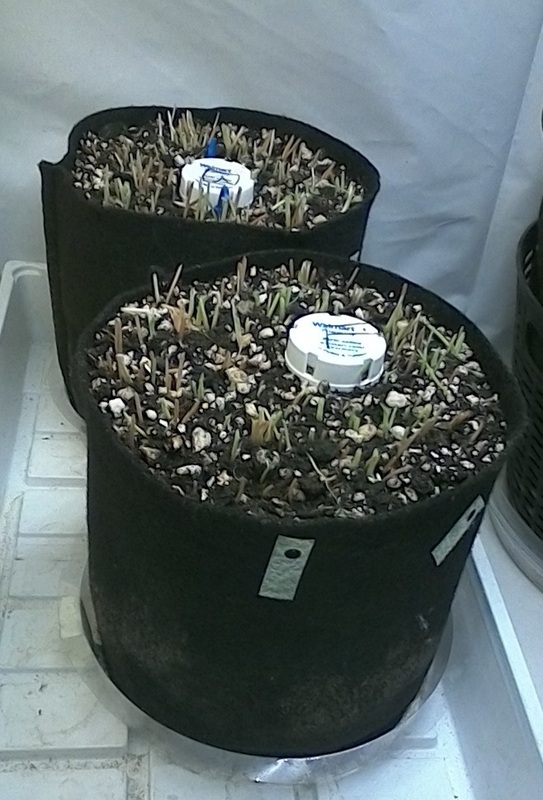 In the last round the Janis duo, in 1 gallon fabric containers, had a mixture of amended and new soil. When they were harvested, the containers were clipped of the cover crop and left to dry completely. From late May to early August they were more than dry. They felt like papermache balloons. Since they were clones in jiffy pucks, a few thrusts with the knife and the puck and stem pulled out. On one (blue) the soil was broken up with knife into about 8 wedges, other tried to leave intact. 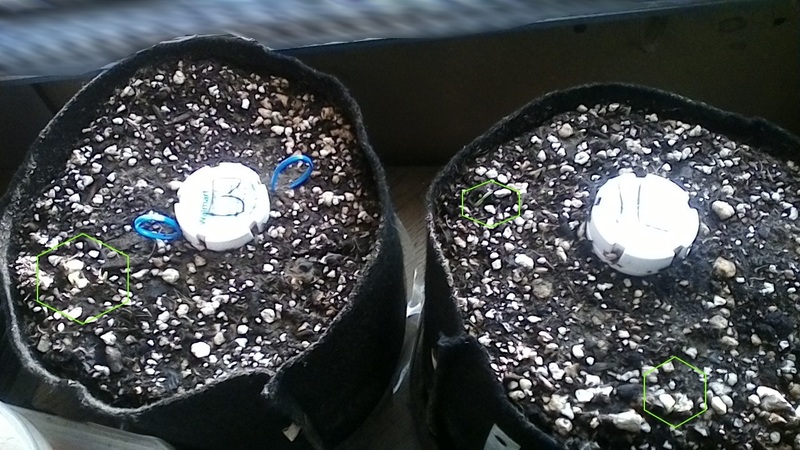 They'll both get jiffy puck clones for flower round 2 and will have 45 to 60 days before they are needed. They got the peas & oats plus the buckwheat. Rather a lot of it, but will find out. 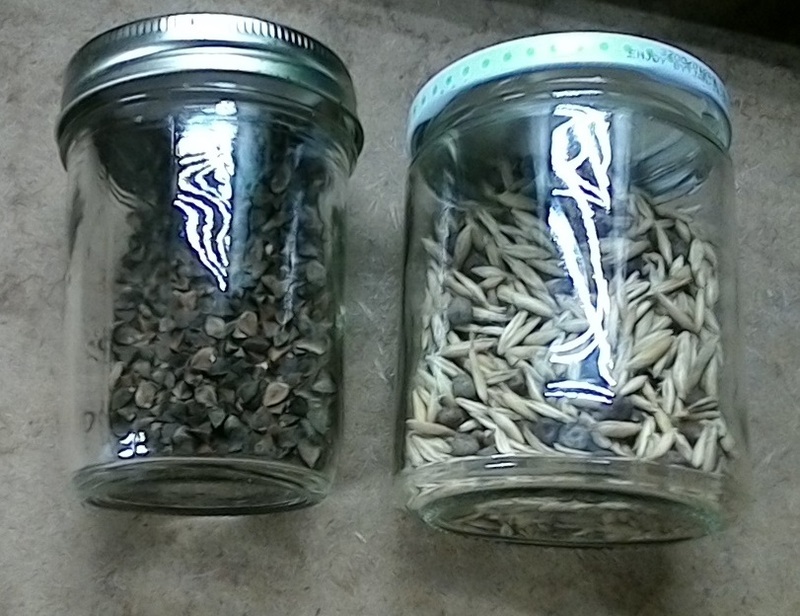 On top of the seeds is an inch of the amended recycled soil from the tubs & cups. Bringing the containers back to service slowly. The top few inches are moist and surface left to dry. Slowly adding from the bottom feed trays. Day 1 took 250ml a few minutes to absorb, the following day it sucked the tray dry almost immediately. Outside fabric feels dry so have a ways to go. where they get low light, to the veg area for a while. the veg lights are on from 8 to 12 both AM and PM. Giving 5 hours light 8 dark. Not sure how the cannabis would react. light, but have both 700mA and 1000mA capability. For veg 700 is fine if not a bit high. Another week of the odd hours. 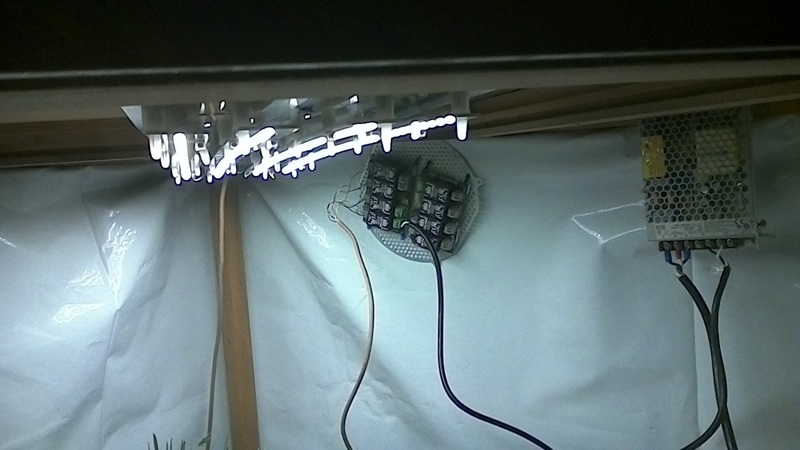 The peas were within inches of the lights and trimmed. Could use a bit less, but the buckwheat is forming flowers already. Trimmed it all but left the stubs, the oats might regrow but will see. Added in a sprinkle of the crimson clover, lightly spread. chugging along and start dumping nitrogen back into storage. prop up some of those floppy stems without shadowing it. I'd leave the chopped stuff right on top as a nice mulch decomposing along the way to give additional nutrient boost to the soil! Out shopping for more cover crop, the first of the end of year markdowns. With clover and such I believe you can mow it before tilling under, but can't you just knock it down and turn it under as well like a green compost for nitrogen fixation? From my understanding legume Like plants form nodules on their roots with the symbiotic relationship of ribosomal bacteria that serve as the plants nitrogen reserve .